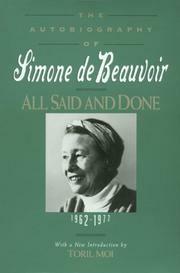 As the finality of the title indicates, Simone de Beauvoir considers this the last volume of her autobiography, a summing-up. At the outset she promises to consider in terms of its "themes" a life which in the previous four volumes (Memoirs of a Dutiful Daughter, The Prime of Life, Force of Circumstance, A Very Easy Death) she has related more in terms of its events. It is a promise she never fulfills. This book is a pleasant but somehow centerless compendium of odds and ends from the ten years since the publication of Force of Circumstance -- new and continued friendships, deaths, dreams, fond gossip, books read, films and plays seen, works written (here explained and defended against critics), travels touristic and political, feminist and socialist ideas -- prefaced by a more forceful but still unevenly interesting essay on the provocative question, "Why am I myself?". Her meditations on this subject consist of brief recapitulations of the stages of her life from the perspective of Sartrean psychology (the conflict between one's sense of subject and one's treatment by others as an object) and of the related question of free will: to what extent is a human being formed by circumstance -- parents, social class, friendships, schooling -- and to what extent did Beauvoir shape herself?. She traces with satisfaction the persistence from her youngest years of a stubborn will and an "eagerness for knowledge" that have guided her through circumstance; but she never really comes to terms with the question. There are flashes of intensity and wonder -- especially in Beauvoir's account of her relationship with a young woman who is obviously an intellectual adopted daughter, perhaps because Sylvie gives Beauvoir the grasp of the future which old age by her own testimony lacks, and without which she has, alas, loosened her grip on the present.